The foundation of yoga practice is rooted in spiritual principal, but one style that draws primarily from the well of enlightenment is Kundalini Yoga. In Sanskrit, the word kundalini generally references a coil or curl. Practitioners believe Kundalini Yoga releases untapped mystical energy. Pronounced "kun-da-lee-nee," this extremely ancient Indian yoga method incorporates every aspect of yoga, including specific breathing techniques, postures, chanting and most importantly, meditation, all designed to awaken latent energy. According to The Times of India, the visual most associated with Kundalini Yoga in order to extend an understanding of it is a serpent resting at the base of the spine, a reference to the coiled power available within everyone. As the energy is stimulated through exact exercises or kriyas, the serpent rises along the spine, passes through the body's chakras and releases spiritual awareness through the crown of the head, achieving the ultimate goal of enhanced enlightenment. Yogi Bhajan, Kundalini master, indicates that yogis have to follow the series of kriyas exactly as originally written. 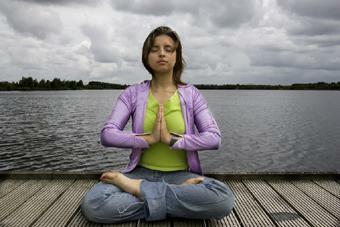 With other yoga paths, instructors can often modify the poses. The exercises aren't as vigorous or complicated as other styles of yoga, such as Bikram or Ashtanga, but some new to the practice have experienced slight nausea or lightheadedness until they become used to the movements. Practitioners view this form of yoga as more of a divine experience, connecting to the unconscious potential of higher enlightenment. Because of this spiritual connotation, everyone from theologians to psychiatrists has studied the theory of Kundalini, its practice and its effects. A name that frequently comes up in conjunction with Kundalini is Yogi Bhajan. According to his biography on the Kundalini Research Instiute site, he's considered to be one of the first yogis to introduce the practice to the United States. He arrived in America in the late 1960s. Before this, Kundalini had been a sacred, private ritual, passed on from teachers only through dedicated discipline and devotion on behalf of the student. Yogi Bhajan believed in sharing Kundalini yoga with the masses because, as he once noted, "I am sharing these teachings to create a science of the total self. It is the birthright of every human being to be healthy, happy and holy." Cleanse the liver and other organs and glands. Stimulate the nervous system and chemical reactions in the brain. As the practice deepens, the combination of the breath, mantra and movement increase stages of consciousness, a unique experience unto each individual practitioner. You can find teachers and classes in your area by searching the Kripalu Yoga Teachers directory. Kundalini Yoga: A Complete Course covers the basics like breathing, physical exercises, meditations and relaxation. The set, designed by instructor Nirvair Singh, includes eight DVDs and two books. Kundalini Yoga for Beginners and Beyond by Ana Brett and Ravi Singh features two 25-minute sets that can be combined for one full workout or practiced separately. The Kundalini Yoga Experience by Dharam S. Khalsa and Darryl O'Keeffe is an illustrated guide to "bringing mind, body and spirit together." The Kundalini Book of Living and Dying: Gateways to Higher Consciousness by Ravindra Kumar explores the more spiritual aspects of Kundalini. The practice of yoga is a journey of many steps. Take the time to teach your body the motions and your mind the methodology.